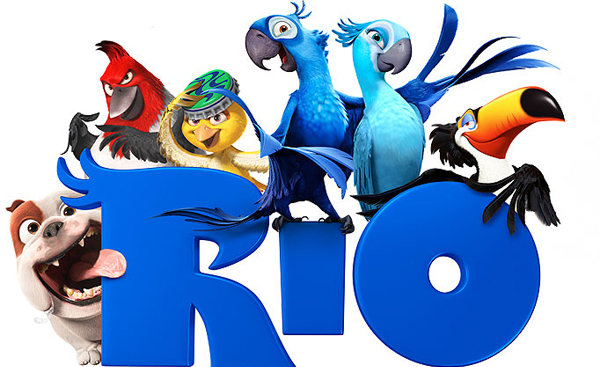 In the movie Rio the hero, Blu, and the heroine, Jewel, are the last surviving specimes of the blue macaw. Unless they can mate successfully, their species will die out. Efforts to prevent this dire outcome generate the film's thrills and spills. Imagine, for a moment, being one of the last of our species…it’s pretty hard! There would be no one else for miles around, and you’d be very lonely!! That is how it was for Presley, a lone Spix's Macaw living in a Colorado living room. He was one of the last of his kind. This bird was the inspiration for director Carlos Saldanha to make the movie!! There has been a lot of buzz about the release of Rio: the Movie, a quirky tale about a hapless macaw and his journey to a new life. What many people do not realize is that this story is based on the real story of Presley, a critically endangered Spix’s Macaw that was found languishing in Colorado in 2002 after the death of his mate. The story of how he was found and sent back to his native Brazil to meet a new mate is nothing short of miraculous! The parrot was discovered by accident in Colorado when a woman from a Denver suburb called an avian veterinarian’s office in August. A parrot enthusiast, happened to answer the phone. The woman said she owned a Spix's Macaw and asked for suggestions on how to take care of the bird. That's the fate of the vanishing species, which went extinct in the wild two years ago. Its numbers were decimated by smugglers, who snatched birds out of the rain forest and smuggled them to sell to wealthy collectors around the world. It’s a trade that outrages animal lovers, and the sight of a Spix's Macaw in a suburban American living room is unbelievable! In the movie, Blu was unable to fly although he was fully feathered. Presley on the other hand became accustomed to a down low from being clipped. Presley was estimated to be 25 years old and DNA confirmed to be a Spix's Macaw. After at least a quarter century of captivity in another country, Presley returned home. At his first stop at the São Paulo zoo the veterinarian said that Presley was doing fine, he was eating well and was very healthy. Officials plan to move him to Recife, where the breeding program is underway. In 15 years, we hope we will be talking about Presley having reproduced! Untill then the bird is living at the Lymington Foundationm in the state of São Paulo in Brazil. In some way, he will contribute to the continuation of his species!! So grab a friend, and go out to watch Rio this weekend. While you are at it, take the time to reflect on the deeper meaning of the movie. Blu and Presley’s stories have happy endings. Let’s make sure that other Spix’s Macaws do, too! Presley’s incredible rescue story is a true inspiration for all. Beautiful moon, tomorrow lot's of sun!! VC. está cada vez melhor!!! I got a question, how come people still can own this macaw, as they nearly critically endangered? Should it be something illegal? My kids watch Rio every day, and love the parrots. I was looking up Hyacinth Macaw but those look purple/violet. Then I found this page, thanks for the story and clarifying that for us all about the Spix. I saw the movie rio but how are we keep do we keep the number`s up with the captive birds??? i wish i had a blue macaw! It's a shame about the Spix's Macaws. I loved Rio. My great grandfather had one from when he went to Brazil. I don't know what happened to the Spix. The first time I saw Rio, I thought they were Hyacinth Macaws, cause they looked so much like my macaws. It's terrible that so many beutiful birds are being killed, and captured from the wild for the pet trade. I know my Hyacinth macaws are becoming increasingly rare like the Spix. I got my birds from a friend who could no longer care for them. After that I found out they can price up to $10,000 a piece, and I have two of them! Don't alot of the pet birds come from breeders now? I know poaching still goes on but I also know people do breed them as well. I had Finches and my birds I bred And also got birds from breeders. Is it the same in parrots? I was doing some research on the macaw and found your page. Nice entry and thanks for the reminder. More people that have these and other critically endangered animal should come forward before they are lost. We need to share DNA between breeding programs & DNA sequence the remaining stock. It would be nice to see them flying free in the Amazon, so stop cutting down the trees to grow palm oil & cattle ranches for McDonald's. Palm oil is predominantly asian. I'm 11 and I watch Rio ALL the time!! I'm a BlUE MACAW fan too! :-) And the FOREST should be protected from smugglers!! Where there's a will.... there's a way!! or should be human that be extincted from this earth? human has made lot of mistakes all the time. mostly of us never have any idea how big the damage human can did, even now they are trying to fix it... sigh. wishing you are birds collectors were happy with your collection that you can bragged about. and those smugglers could filled their stomach with those money they got from smuggling. Ԝoah! I'm really loving the template/theme of this site. for me on Safaгi. Excellent Blog! If you are asked for this information, you can be confident Sony is not the entity asking. there be an announcement at CES 2012 from Microsoft or any of their partners regarding the next gen console. Its simply because tethered jailbreaks are irritating. you can watch Flash video and Flash website on your iPad now. Start by downloading the newest edition of iTunes.